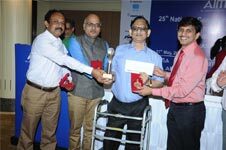 The National Management Games (NMG) 'Chanakya', an all India competition for corporates organised annually by All India Management Association (AIMA), was successfully concluded on 27th May, 2016 at New Delhi this year. 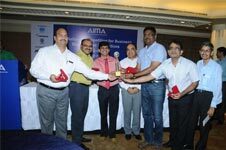 AIMA celebrated the Silver Jubilee (25th) edition of NMG this year. The competition was held in the Eastern, Western, Northern and Southern Regions. 'Chanakya' is a computer based simulated game that sensitises and strengthens business acumen in students where participants are handed over a hypothetical company to run business. A team of 4 participants from an organisation form a company and run it in a virtual environment created by Chanakya. This year about more than 100 teams participated from all over India comprising of both private and PSU companies. 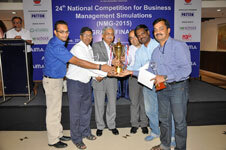 This year's NMG was sponsored by Mother Dairy, Pepsico, PowerGrid Corporation of India, JSW Energy and Patton The venue hosts were KIIT School of Management, Bhubaneswar; M S Ramaiah Institute of Management, Bangalore; Welingkar Institute of Management, Mumbai and New Delhi Institute of Management, New Delhi. 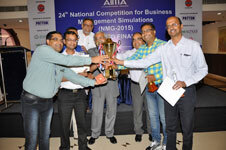 The 24th National Competition for Business Management Simulation Games known as National Management Games (NMG) and branded as Chanakya was organized from 1st May to 20th June, 2015. The Competition was held in four regions i.e. Bhubaneshwar (East), Chennai (South), New Delhi (North), and Mumbai (West). 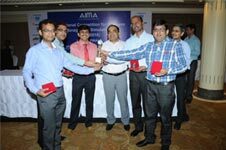 NTPC, Power Grid Corporation of India Ltd., and Steel Authority of India Limited emerged as the three best teams. The champion team will get cash prize worth Rs 100,000/- and the 1st runners up will receive cash prize worth Rs 60,000/- whereas the 2nd runners up will fight for cash prize worth Rs 40,000. NTPC and Power Grid will go on to represent India at the Asian and Global level next. 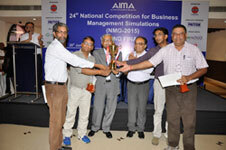 NMG is a unique and one of the most awaited and prestigious annual events in Business Management Simulations organized by AIMA. It is an inimitable event for Corporate Managers to experience the thrill of managing business in a competitive mode where participants get exposed to the intricacies of managing a company with the focus on resource management, economic impact, operational challenges, customer's . This year, 120 teams from across the country had participated in all the four regions (Bhubaneswar, Bangalore, Mumbai and Delhi) from Public and Private sector companies. The event was sponsored by IndianOil Corporation and PATTON.